All Manuscripts sent to the NIJP should not be sent in any other journal or publication. These become the sole property of the publishers. The manuscripts submitted should be accompanied by a certificate signed by all the authors that “The undersigned author(s) certifies (fy) that the submitted article is original and is not under consideration with other publisher and has not been published anywhere in the past. All copyright ownership of the manuscript is transferred to the publisher of NIJP”. The manuscript should include the ethical clearance certificate from appropriate authorities. Articles are edited for grammar and style. The spelling pattern in the journal is of American style. The statement and opinions expressed in the manuscripts are essentially of the author(s) and the editors / publishers don’t owe any responsibility for these. The product, service or the claim made by the manufacturer as advertised in the journal are those of the manufacturer. The publishers don’t endorse these claims. Manuscript should be submitted in MS Office word, Use Font type Times New Roman12 point for text. Title Page: This contains the title of the manuscripts along with the name of the author(s)with their affiliations. The name of the institute where the study was carried out, the address for correspondence with e-mail of the author should be mentioned at the bottom of the page. Abstract: The objective, method of the study, results and conclusion should be sent in a paragraph as abstract of the manuscript. It should contain the purpose of the study, selection of study subjects, specific data denoting the main findings and the chief conclusions. The new and important aspects of the study should be revealed by the abstract. Key words (four to five), Introduction, Material and method, Results, Discussion and Conclusions, Conflict of Interest, Funding, acknowledgment etc. The text should preferably be in a simple language which is easy to understand, pertaining to the topic concerned and should avoid vocabulary jargon. Tables: Each table should have title and be numbered in the order of appearance in the text. Use superscript letters to indicate foot-notes typed on top of the table. Quote all tables in the text. Images: All image files must be of high quality(300DPI)inTIForBMP format. Do not send JPG or GIF files. Line diagrams should be in editable format. All images should be submitted separately and not as apart of main manuscript. Quote all images in the text as figure numbers in Arabic numerals printed at the bottom of figures. The last element of the text is acknowledgment. Abbreviations if used should be in accordance with the international guidelines e.g. cm, ml etc. Abbreviation use should be kept to the minimum and if they are used, they should be preceded by the full form. Names of author(s): If more authors are involved in the study, the first 6 names should appear ending with et al, the title of the paper, Name of the journal as appears in Index Medicus, publication year, volume number and first and last page numbers. References from the book includes, name of the book, editors, place of publication, publisher, edition, the year of publication and first and last page numbers. 1. 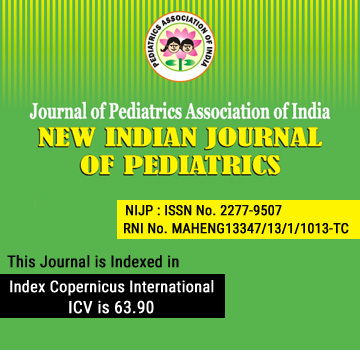 Mahesh Baldawa, Satish Tiwari: Legal issues and preventable medical errors, New Indian Journal of Pediatrics 2012, 1: 8-12. Harms Roger W. Breast-feeding while pregnant: Is it safe? http://www.mayoclinic.com/health/breast-feeding-while-pregnant/AN01840 Accessed on 16th Oct 2011.